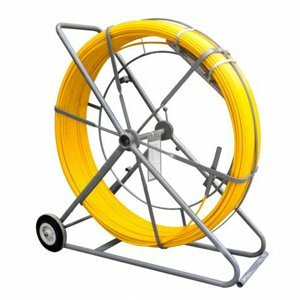 Buried telecom ducts made of HDPE (or other plastic variants) are non-metallic and undetectable by general purpose pipe & cable locators. 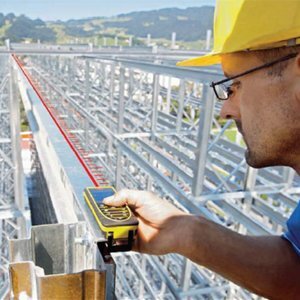 Telecom duct laying or water pipelines are generally non-metallic and the following issues are commonly faced during projects. a. Ducts laid in major cities or towns laid by direct burial or HDD are not permanently marked and information on route of buried nonmetallic ducts is not known to the project teams. b. While backfilling during telecom pipe laying, many times the telecom ducts get pinched or debris are left inside the duct causing duct blockages – and leaving Outside plant OFC teams unable to install optical fiber cables inside the buried ducts. b.Pin point exact point of blockage in ducts to allow finite digging to repair route, where required. 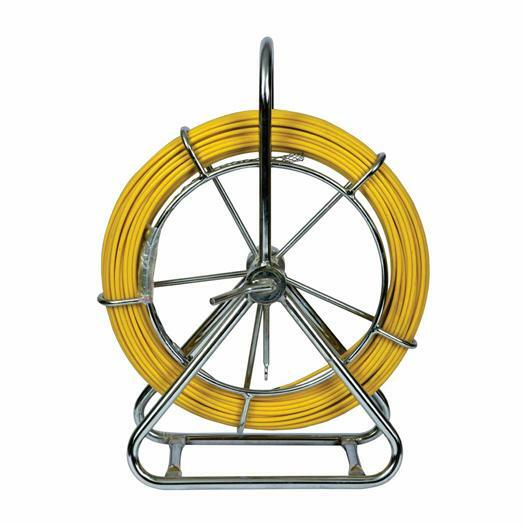 b. Traceable duct rodder designed for use in telecom ducts of 26mm inner dia or higher, up to lengths of 300 meters (1000 feet). c. Miniaturized sonde frequency transmitter, operating at low frequencies, for use in small dia telecom ducts (or larger pipes) which allow the sonde to pass through ducts including bends. d. Transmitter to energize the CTRAK traceable rodder. 1. 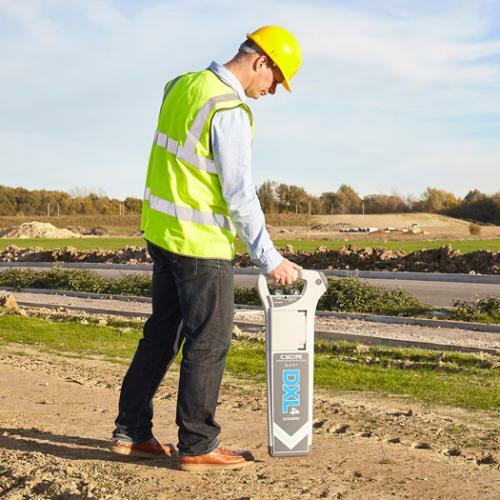 Quick detection of route of lost telecom ducts. 2. Confirmation of depths at which ducts had been laid, allowing as-built maps to be updated. 3. 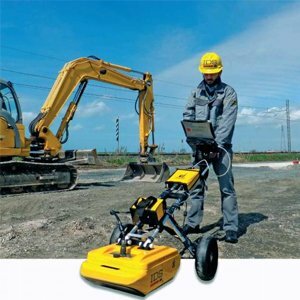 Detection of blockages in ducts with precision allowing the field teams to dig at a specific point, especially important in major city or town environments where random digging is not possible. 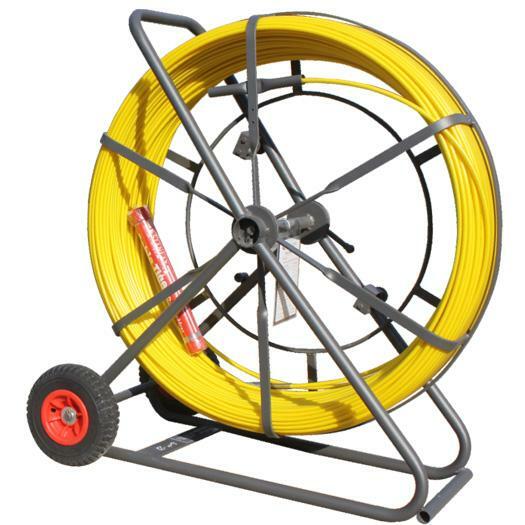 The SONDE operating at 512Hz is attached to the CTRAK Traceable Duct rodder unit & is pushed inside the non-metallic HDPE Conduit or any other line until it stops due to blockage in HDPE pipe or because of entry into the next manhole. The CTRAK contains a 1 sq. mm tracer which is energized by the Line exciter at 8/16/32 or 64 kHz. The digital receiver is then set to receive frequencies at 8/16/32 or 64 kHz to trace direction and route of line in the Line Tracing Mode. 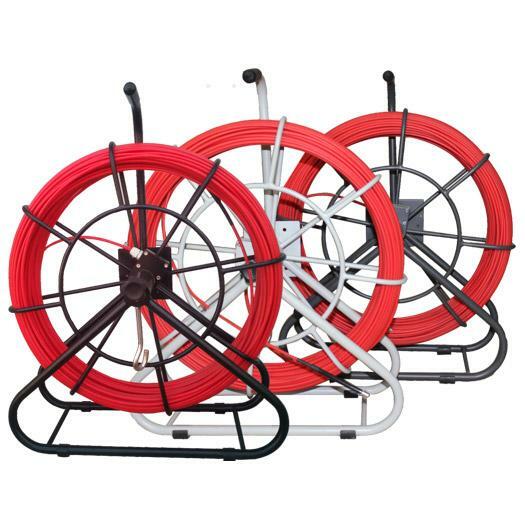 Once the trace is completed until the line trace starts to fade, the receiver setting is changed to the Sonde Tracing Mode to receive 512Hz frequency transmitted by the SONDE or any other customized frequency which can then be used to pin point exact point of blockage in HDPE conduit or manhole location. Please refer features for seeing visual illustrations of steps to be followed to achieve above objectives. Speaker output Variable rate click; headphone jack. Sound can be muted. 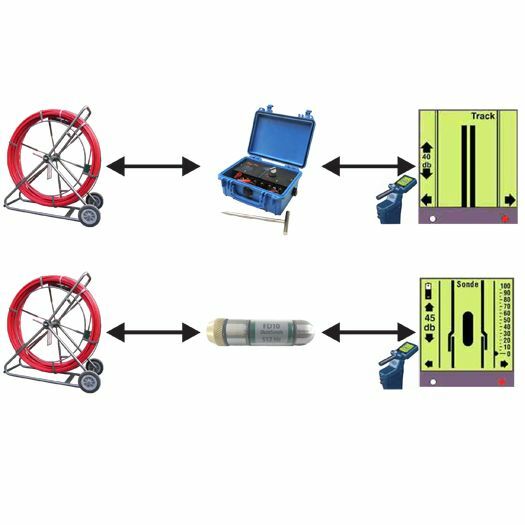 Choose mode of operation i.e line tracing, sonde tracing, power line tracing & corresponding frequency of operation per user option. Line tracing mode - the operator simply has to come in parallel line with the inserted traceable rodder or buried armored OFC being traced. 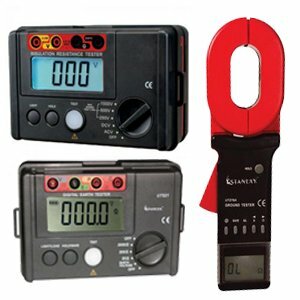 The LF will provided 3 ways of guiding the operator - the line on the screen become solid as shown as the operator aligns, a red LED light up on the screen & the handle of the LF goes into a constant vibration mode. 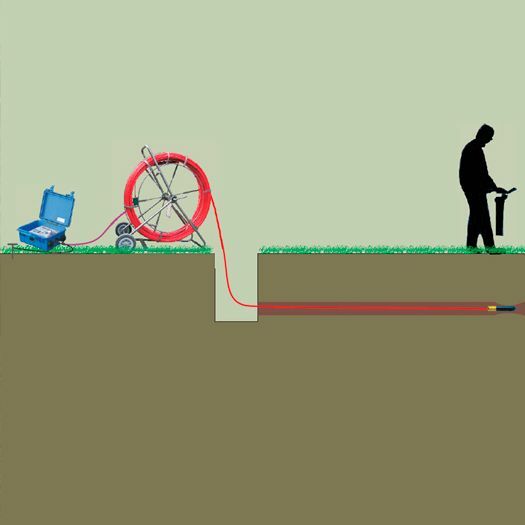 In case of sonde locating mode for detecting blockages in buried pipe, the first step is to detect & confirm proximity to sonde inserted inside buried duct. The signal will keep on rising higher and will first reduce (due to AGC) and then stabilize to within +/-5 digits to localize presence of the sonde and indicate that the operator is standing over or very close to the Sonde inside the buried duct. (Refer step 3 visual). Step 4 As the buried duct may be buried at an angle to the horizontal, the operator first needs to form a circle of approx. 5 to 10 feet radius around the point at which sonde was localized. 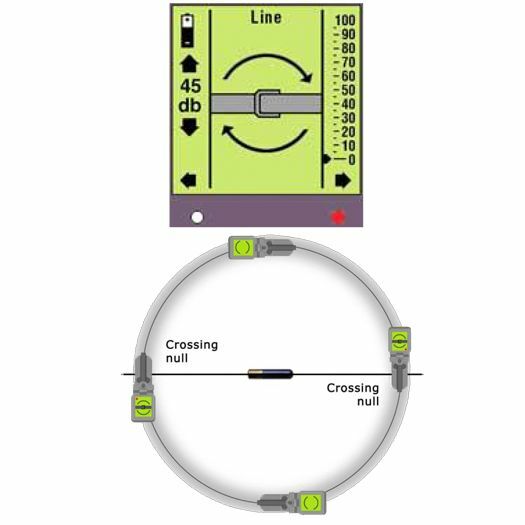 By walking around the circle, the direction finding mode allows the operator to know the exact orientation of the sonde and therefore the buried duct. (Refer step 4 visual). The operator then walks along the direction of the sonde identified from one edge of the circle established. The operation first sees a null i.e two white and black circles indicating that he is about to be over the sonde. Walking a couple of steps further will provide a sonde image as shown indicating that he has established exact location of the sonde. Walking another couple of steps further provides the nulls again confirming that the operator has passed the sonde.